It is possible to compress a lot of gas into a small space. The total mass of the gas remains the same, but the molecules are pushed closely together. It is possible to fill a tank that would normally have, say, 12 L (0.4 cubic feet) of air at normal atmospheric pressure (1 bar or atmosphere) many times over so that eventually it might contain more than 200 bars (200 atmospheres). Diving tanks are filled using a high-pressure compressor. First of all, a source of clean uncontaminated air is required. Positioning the compressor intake so that air does not get air contaminated with carbon monoxide or another unwanted gas is important, especially in an environment that may have a gas or diesel engine close by. This includes aboard boats, in urban areas or even close to the primary drive of the compressor. For this reason, small, portable compressors are best used in windy locations. They have a long snorkel tube to the air intake that is as far away from the engine as possible. The next problem encountered is that air expands when it gets hot, and the act of pressurising air produces a lot of heat. Compressor designers get around this problem by compressing the gas in three or more separate stages, with progressively higher pressure pistons and cylinders to each pump. This is called adiabatic compression. Between each stage, the air is transported through a long series of pipes equipped with heat exchangers. In bigger installations, these pipes are oil-cooled, but smaller compressors have big fans to cool the heat exchangers. Small air-cooled compressors need to be positioned so that they are in the shade and have a good flow of ambient air over them even if powered by electricity. The act of compressing the air also squeezes any humidity out of it. This collects in the compressor in the form of a condensate, which is a mixture of condensation and oil vapor. Removal of this water is especially important when filling tanks with nitrox because the elevated levels of oxygen in nitrox can combine with water and cause the inside of the tank to deteriorate. The oil used in the compressor is special in that it is free of poisonous hydrocarbons. The air is also filtered both through carbon granules to remove any unwelcome flavour and through a molecular sieve to remove any unwanted content. In order to compress air to make nitrox, it must be compressed twice. The latest installations have a low-pressure compressor installed alongside the main compressor in order to do this. 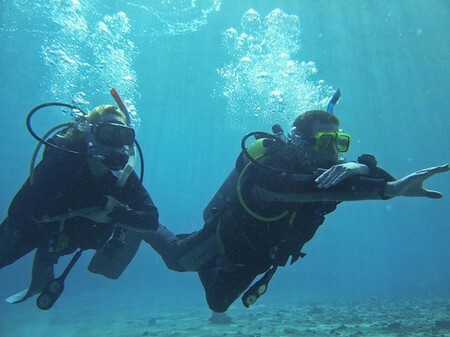 No matter what the capacity of the compressor installation, there will always be fluctuation in demand, with everyone wanting to go diving at the same time. Most commercial compressor installations bank the gas they compress into very large high-pressure cylinders so that it can be quickly decanted into the divers’ cylinders when it is needed. This is especially common aboard dive vessels that use the time while cruising between dive sites to compress the gas for the next dive.